Flat-panel TVs with 30 channels of HD programming. Easy-access Plug-and-Play feature makes it simple to connect electronics. 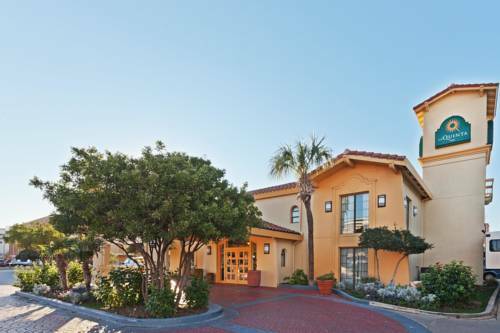 Just steps away from Market Square in the heart of downtown, the La Quinta Inn San Antonio Market Square is within walking distance of several attractions including the Alamo, Riverwalk, and Convention Center. The King William Historical District, Mission Trail, and River Center Mall, are also easily accessible from this hotel. The San Antonio Zoo, Sea World, and Fiesta Texas/Six Flags are also only a short drive away. Our friendly staff, here, at the La Quinta Inn San Antonio Market Square serves up a Free Bright Side BreakfastTM every morning and Mi Tierra Cafe and Bakery across the street is open 24-hours, too. All rooms come with a coffee maker, hair dryer, and a variety of other useful amenities. Enjoy the sparkling outdoor pool at your leisure. Located just west of US 10 (free parking); downtown trolley service available. We are convenient for visitors to Santa Rosa Hospital (one block), and HEB Corporate Headquarters. All guaranteed reservations must be cancelled before 6 p.m. hotel time on day of arrival to avoid billing. Make note of your cancellation number for your records.